I will indulge the reader for a bit of true WWII history. 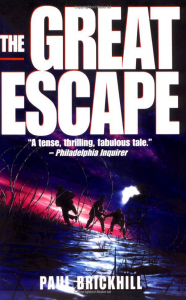 If you liked the film you’ll love the actual story of the daring escape from Stalag Luft III in Sagan, Germany. Brickhill was a prisoner who did not go through the tunnel on that fateful night, for which he was later thankful. After the war he wrote this extensive account of the event. Much was like the film portrayed and much was not (no Steve McQueen jumping motorcycles over wire fences). Of the 76 who made it through the tunnel only three actually escaped. The rest were rounded up quickly. Hitler wanted them all shot but settled for 50. After the war R.A.F. Special Investigations hunted down and brought to justice all the Germans who did the shootings. The book and the film were dedicated to the 50.